Fulghum grew up in Waco, Texas, and before he began writing full time, he was a Unitarian minister and an art and philosophy teacher. The first essay in Fulghum’s book, called “Credo,” explains the origin of his book’s title. Fulghum explains that each spring throughout his life he would sit down and write a personal credo, a list of statements of personal belief. This list evolved over the years with statements that were sometimes comical, sometimes bland, sometimes cynical, and sometimes over-complicated. The final version of his credo came to him, however, when he realized that true meaning in life did not need to be complicated. 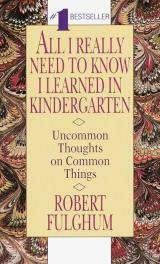 In fact, he already knew what he needed to know; he had learned it a long time ago in kindergarten. The basic rules he learned like “Share everything,” “Play fair,” and “Clear up your own mess” served him throughout life (1). All I Really Need to Know I Learned in Kindergarten has spawned numerous imitations, spinoffs, and parodies based on television shows, movies, books, etc. These imitations adopt Fulghum’s title and list as their template, beginning with “All I Really Need to Know I Learned From ______,” followed by a list of principles based on the source of inspiration. One example of this kind of spinoff is a book, published in 2014 by Paul Oyer, Everything I Ever Needed to Know about Economics I Learned from Online Dating. 1-Fulghum, Robert. All I Really Need to Know I Learned in Kindergarten. New York: Ballantine Books, 1989. On this day in 1890, Lewis Carroll (1832-1898), English writer and mathematician, published an essay entitled “Eight or Nine Wise Words About Letter Writing.” Best known for his works Alice in Wonderland and “Jabberwocky,” Lewis Carroll’s essay on letter writing was included as a booklet in the “Wonderland” Postage-Stamp-Case, a product designed to help letter writers organize their postage and correspondence. Rule 2: Begin with remarks about your reader or your reader’s last letter rather than about yourself or about your apologies for not having written sooner. Rule 3: Don’t repeat yourself. Rule 4: If you think your letter might irritate your friend, set it aside for a day and re-read it again. Then, re-write the letter, if necessary, to make it less offensive. Also, keep a copy of the letter so that you’ll have a record of what you actually said. Rule 5: If your friend makes a severe remark in his or her letter, either ignore it or respond in a less severe way. Rule 6: Don’t try to have the last word. Rule 7: Watch out for sarcasm and humor. If you write in jest, make sure that it is obvious. Rule 8: If you write in your letter that you have enclosed something, stop writing for a moment and get the item for enclosure and put it into the envelope immediately. Rule 9: If you get to the end of the note-sheet and you have more to say, take out another piece of paper instead of cross-writing. (Cross writing was a paper-saving practice of writing vertically over the horizontal lines of your letter) (1). What seems to unify Carroll’s rules is the consideration for the reader. Carroll reminds writers to avoid egocentricity and to craft every sentence with the reader in mind. Even though letter writing today is certainly less popular than in Carroll’s time, his emphasis on this universal writing principle — “Put the reader first” — makes his rules applicable to just about any form of writing. 1-Carroll, Lewis. Eight or Nine Wise Words About Letter Writing. 1890. Public Domain Project Gutenberg. https://www.gutenberg.org/files/38065/38065-h/38065-h.htm. Shaw began his speech by identifying eight great men of history whom he called “makers of universes.” These men were Pythagoras, Ptolemy, Kepler, Copernicus, Aristotle, Galileo, Newton, and Einstein — all great men of science, who unlike the “makers of empires” did not have hands “stained with the blood of their fellow men.” Shaw continued by comparing Isaac Newton (1643-1727) and Einstein, explaining how Einstein challenged Newton’s rectilinear view of the universe, replacing this view with his curvilinear universe. The Englishman Newton presented a model for the universe that stood for 300 years. In 1916, at the age of 26, Einstein gave the world a new model, his theory of general relativity (1). 1-Safire, William. Lend Me Your Ears: Great Speeches in History. New York: W. W. Norton & Company, 1997: 206-8. On this day in 1787, Federalist Paper 1 was published in the Independent Journal of New York. Today Americans take the Constitutional form of government for granted. But in 1787, shortly after the young, ragtag nation had thrown off the British monarchy and won its independence, a constitution was not a given. The questions at that time were — would there be a central federal government at all, and if there were, what would be its powers? The original basis for the united thirteen states was the Articles of Confederation, but this gave the federal government little power: no power to levy taxes, to regulate trade, or to enforce laws. The Constitution, which offered a plan for a federal government based on checks and balances, was drafted in September of 1787, but it still needed to be ratified by at least nine states. In October 1787, therefore, the federalists began their debate with the anti-federalists. One of the chief proponents of the Constitution was Alexander Hamilton, the chief aide to George Washington during the Revolutionary War and an elected representative from New York state to the Congress of the Confederation. Hamilton knew that New York would be a key swing state in the debate, so he hatched a plan to write essays that would be published in New York newspapers to promote and explain the new Constitution. To help him, Hamilton enlisted James Madison, who had served in the Continental Congress, and John Jay, a lawyer and diplomat. Between October 1787 and May 1788, the trio wrote a total of 85 essays, totaling more than 175,000 words. Each essay was published anonymously under the pen name “Publius,” an allusion to Publius Valerius Publicola, a supporter of the Roman Republic. The Federalist Papers served as a kind of user’s guide to the Constitution, explaining how the people, not a king, would govern and how a federal government was needed to increase efficiency and to prevent the risk of another monarchy. The papers also explained the separation of powers between the branches of government, and how government should operate to maintain individual liberty without anarchy. In the end, the federalists won. All thirteen states ratified the U.S. Constitution. Today we have all 85 Federalist Papers intact as testimony to the work of Hamilton, Madison, and Jay. Reading them, however, is not easy. They are written in dense 18th century prose. With careful focus and attention, however, they can be understood. It is this kind of careful close reading that the College Board had in mind when it redesigned its Scholastic Aptitude Test, which took effect in 2016. One specific area of emphasis in the redesign of the SAT reading test is U.S. founding documents, which includes the U.S. Constitution, the Bill of Rights, and the Federalist Papers (2). Open with a topic sentence that identifies the author and title of the work being summarized. Make sure your summary is clear to someone who has not read the original. Focus on the main points rather than the details. Paraphrase by using your own words without quoting words directly from the original passage. Be objective, by reporting the ideas in the passage without stating your own opinions or ideas regarding the passage or its author. 1- Beck, Glenn with Joshua Charles. The Original Argument: The Federalists’ Case for the Constitution, Adapted for the 21st Century. New York: Threshold Editions, 2011: xxi-xxxi. On this day in 1999, a web developer named Benj Clews had a brief but ingenious idea. Clews wanted to create a website for movie reviews, but he wanted it to be different. His idea was to limit the movie reviews to four words or fewer. That same year he created the website Four Word Film Review, which in the internet tradition of crowdsourcing, invites readers to submit their reviews. Most of the reviews at www.fwfr.com are not so much reviews as they are new titles, but the fun comes in the wonderful wordplay that results. Puns, alliteration, and adaptations of other film titles are all a part of the creative writing game of making every word count. Reading four-word movie reviews is fun in itself, but there is also something to be learned here. Shakespeare said that ‘Brevity is the soul of wit.’ In other words, the essence of good writing is economy. As you read four word reviews and begin to write your own, you’ll learn that wordplay can be hard work, but the rewards are satisfying for both you, the writer, and your readers. Also read newspaper headlines and notice how headline writers work with the same kind of wordplay to attract the reader’s attention. A good title is vital, so when you write an essay, take some time to write a short, but sweet, title of four words or fewer. 1-Clews, Benj and Michael Onesi. Four Word Film Reviews. Massachusetts: Adams Media, 2010. On this day in 1957, movie executive Sam Frey sent director Alfred Hitchcock a list of suggested alternative titles to the film that Hitchcock was shooting. The director had been in a continual battle with his studio, Paramount, over the movie’s title. Hitchcock was determined to go with the one-word title Vertigo; the studio, however, rejected the director’s choice. The list of 47 alternative titles was the studio’s last attempt to sway Hitchcock. Hitchcock stood firm with his choice, and when the film opened on May 8, 1958, the movie marquee read Vertigo. The film, starring James Stewart, is based on a French novel entitled D’entre les morts (“from among the dead”). Today it is recognized as one of the greatest psychological thrillers in Hollywood history (1). Today’s Challenge: What’s The Word? 1-Usher, Shaun. Lists of Note: An Eclectic Collection Deserving of a Wider Audience. San Francisco: Chronicle Books, 2015: 242. Today we celebrate not only the single most recognized Americanism ever, but also the single most recognizable word period. On this day in 1839, OK was first published in the Boston Morning Post. Oddly, the word sprung from an intentional misspelling of “all correct.” Following a pre-Civil War fad of misspelling words for comic effect, “all correct” was spelled “oll korrect.” The word gained widespread usage but with a different meaning during the reelection campaign of President Martin Van Buren in 1840. Van Buren’s nickname was “Old Kinderhook,” which alluded to his hometown of Kinderhook, New York. The initials OK became his rallying cry, and even though Van Buren lost the election to William Henry Harrison, OK gained popular usage, becoming an entrenched part of American English. Allan Metcalf, an English professor in Illinois, claims that OK is the single most spoken and typed word in the world. He should know since he wrote an entire book on the word in 2010 called OK: The Improbable Story of America’s Greatest Word. Clearly OK, no matter how you spell it — OK, O.K., ok, okay, okey, or ‘key — is here to stay. 1- Barnhart, David and Allan Metcalf. America in So Many Words: Words That Have Shaped America. New York: Houghton Mifflin Company, 1997. On this day in 1804 and 1837, two famous writers, one British and one American, waged their own personal battles with writer’s block by writing in their journals. The first was the British poet Samuel Taylor Coleridge (1772-1834). Writing in his journal the day after his thirty-second birthday, Coleridge expressed his exasperation at being unable to produce the kind of great poetry he had written in his mid-twenties: “So Completely has a whole year passed, with scarcely the fruites of a month. –O Sorrow and Shame . . . . I have done nothing!” Although Coleridge was writing in his journal, he never again managed to write anything like his great narrative poem “The Rime of the Ancient Mariner,” which had been published six years earlier (1). The second writer was the American Henry David Thoreau. After graduating from college at Harvard in 1837, Thoreau returned to his hometown of Concord, Massachusetts. There he met and was mentored by essayist and poet Ralph Waldo Emerson, who encouraged the fledgling writer to keep a journal in order to record his thoughts and to develop his craft. ‘What are you doing now?’ he asked. ‘Do you keep a journal?’ So I make my first entry to-day. No doubt the journaling habit gave Thoreau the kind of confidence in his own ideas that lead to his two great works, the book Walden and the essay “Civil Disobedience” (See August 9: Walden Day and July 12: Thoreau Day). One interesting note is that the social networking messaging service Twitter used Emerson’s question as its prompt when the online service began in 2006. Each tweet composed was prompted by the question “What are you doing?” In 2009 Twitter changed its prompt to the more succinct “What’s happening?” (3). 2-The Heart of Thoreau’s Journals (Edited by Odell Shepard). New York: Dover Publications, Inc., 1961.